Ageratina altissima (L.) R. M. King & H. Rob. Eupatorium rugosum of Michigan Flora. Swamps and thickets, as in ravines, floodplains, and rich hardwoods; openings and trails, cedar swamps, river banks. 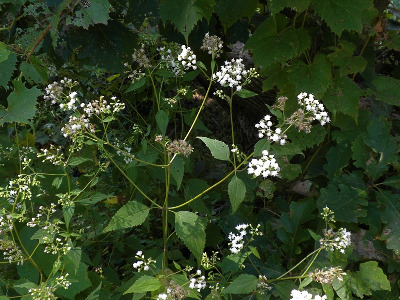 A toxic substance in this plant can cause “trembles,” a fatal disease of cattle which have browsed on it and transmittable to humans by their milk, in whom the consequent “milk sickness” caused many deaths on the 19th century frontier in this country (Duffy, 1990). MICHIGAN FLORA ONLINE. A. A. Reznicek, E. G. Voss, & B. S. Walters. February 2011. University of Michigan. Web. 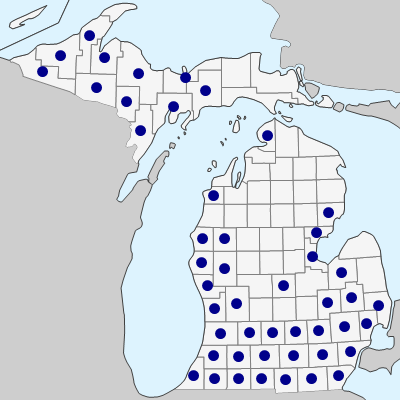 April 24, 2019. https://michiganflora.net/species.aspx?id=211.